We’re glad to have your children here at Central Elementary School - home of the bullpups! Our first priority is to provide a safe learning environment for your elementary-age children to excel and grow. Central Elementary School is a Title I school, educating students from first through fifth grade. We’re proud to offer our students many programs to further their learning opportunities and provide alternate forums in which to interact and grow. We have an excellent English as a Second Language (ESL) program with talented teachers as well as fine arts, learning with technology, tutoring, a rigorous physical education program, and family nights - all of which are designed to cater to the individual student and the individual mind. These are important years for your children, and we want them to have every opportunity to experience an array of alternative programs and activities. We’re happy to provide assistance with any questions or concerns you have. Feel free to contact us with any questions or feedback you may have about your child’s experience at Central Elementary School. You can find our staff directory on our Teachers and Staff page. 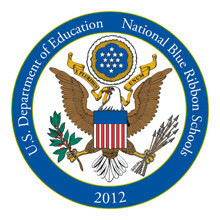 Central Elementary School is proud to be a National Blue Ribbon School. The National Blue Ribbon Schools Program honors schools with a high standard for excellence and high level of achievement. We were recognized in 2012 and continue to set a precedent of continuing improvement and academic achievement. The support of staff members and involved parents, along with effective teaching methods and a spirit of improvement, make Central Elementary School a prime learning environment for our students.